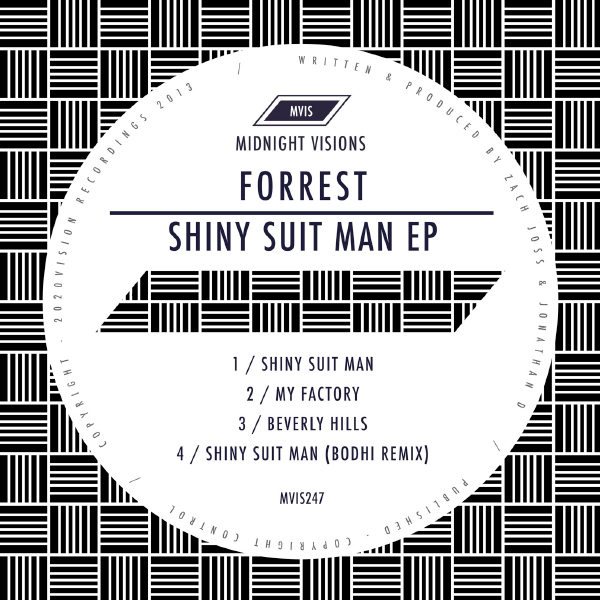 Since his first single ‘Masquerade’ dropped on vinyl just over a year ago, Forrest’s profile has continued to rise, with releases on Noir Music and Mobilee and forthcoming on Visionquest. 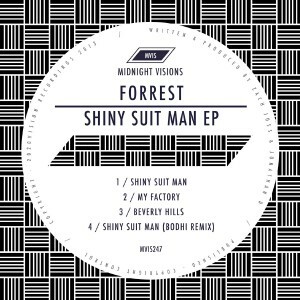 This latest release EP, his debut for Midnight Vision, demonstrates Forrest’s versatile sound. The lead track ‘Shiny Suit Man’ blends hypnotic, cheeky vocals with dusty drums to create a roller, which sounds great both in the headphones and on the dancefloor. My Factory continues on the deep tip mixes with vocal samples and modulating synth lines creating a smokey atmosphere. A slinky bassline drives the track along and will get any floor moving. Beverly Hills teases us with an uncomplicated arrangement of more slick house with sustained strings providing the tension and a great use of a female vocal sample. New kids on the block Bodhi bring a garage swing to their remix of Shiny Suit Man kicks. Heavy syncopated 808’s paired with shuffling synths bring a new flavour to the EP.